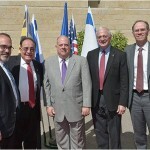 JERUSALEM – Maryland Governor Larry Hogan, University of Maryland, Baltimore (UMB) President Jay A. Perman, MD, and other UMB faculty and officials met with counterparts from the Hebrew University of Jerusalem on Sunday (September 25), to ratify the extension of a successful student exchange program and to explore opportunities for other cooperative activities, such as joint research and training, exchange of scholars for seminars and conferences and increased exchange of students and faculty for research, teaching and study. 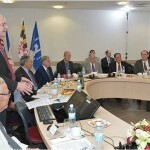 The meeting at the Hebrew University’s Ein Kerem campus was one of many during the governor’s nine-day trade mission to Israel, much of which focused on building business and academic relationships in obvious areas of synergy, such as cyber security and life sciences. 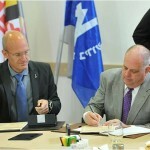 During a 2013 Middle East trade mission, President Perman and Hebrew University President Menahem Ben-Sasson signed a memorandum of understanding, pledging to begin student exchange programs and explore further avenues of cooperation. The agreement, signed today by the two university officials, extends the collaboration for five more years, and anticipates continuing student exchanges as well as the development of other mutually beneficial education and joint research projects. One area of possible collaboration is in military medicine. In 2013 the Hebrew University established the national Institute for Research in Military Medicine (IRMM) in cooperation with the Israel Defense Forces. The institute, directed by Prof. David Gertz, MD, PhD, focuses on research and training with emphasis on the development of new treatments and technologies of direct relevance to force protection and homeland security. In years 2014 and 2015, groups of senior students from the Hebrew University’s Military Track of Medicine from the Hebrew University of Jerusalem Hadassah Medical School spent four weeks observing clinical care at the University of Maryland R Adams Cowley Shock Trauma Center, the nation’s first and foremost trauma care center. Several Hebrew University students who participated in the exchange in 2014 and 2015 shared their experiences, including observing procedures and techniques in initial resuscitation, management of acute injury operations, and orthopedic trauma service. They also attended grand rounds, practiced clinical techniques in the Simulations Center and observed Shock Trauma’s unique organization and team approach. Shock Trauma is one of the few such facilities that operate as a complete center, not a unit of an emergency department. 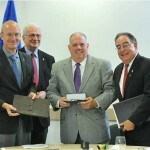 The success of the first phase of collaboration between the University of Maryland, Baltimore and the Hebrew University of Jerusalem sparked an energetic discussion of possible next steps, such as collaborative research and training and the exchange of faculty for teaching assignments.